I would like to draw your attention to a contribution by Frans Badenhorst on chipping, chips and scanners that sheds a lot of light on this subject. It was first published in HuskyRomi’s April newsletter and is reprinted here with permission. A reader has brought to our attention an interesting snippet about canine research results that we have translated for you here, even though it does not (yet) directly relate to wolves. Why do dogs not respond with fear to venomous snakes? We have personally observed two such encounters, one with our two last Groenendaels many years ago, one of which entirely fearlessly killed an adult female rinkhals cobra, and one with Athaba I who had fun playing very skilfully with a baby rinkhals before I noticed, stepped in, caught the snake in my shoe, and released it in a safe place. Mind you, these cobras are short-fused and have a nasty venom. To round it all off, Erin tells how she feels about winter while I am ticking off the days until it can be expected to be over. 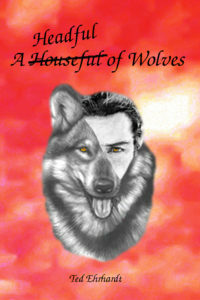 If you have read it, please post a review of my book, A Houseful Headful of Wolves (German edition: Das Haus Den Kopf voller Wölfe), by following the link on SAFOW’s Facebook page or directly at http://safow.org/book-review/ . It can be as short or long as you wish, in English or German, and you can remain completely anonymous. I really love to know how it comes across. Turn your vacation into a one-of-a-kind wilderness experience. The International Wolf Center offers a variety of Adventure Programs led by informative and enthusiastic wolf experts for people of all ages. Visit our website for a complete list of adventure programs here. Sleeping with Wolves, the Wolf Conservation Center‘s popular nocturnal adventure experience gives guests a chance to camp out overnight with the 30 wolves that call the center home! With all the howls and nature’s night-time chatter, you will feel like you’re camping under the stars with wild wolves! The Wolf Conservation Center is pleased to offer summer environmental education internship opportunities for college students! The environmental education internship is designed to expose interns to the field of conservation education and wildlife biology. Interns conduct a variety of education programs and assist with the daily operations of the WCC. SUMMER FAMILY ADVENTURE: August 5 – 10, 2018: Details here. FALL WILDLIFE ADVENTURE: September 8 – 13, 2018: Details here. Don’t really know what to say or write, the loss of Ashak, our ambassador wolf, is a huge blow to me and, I know, to a lot of people out there. He was a part of so many lives, he even gave the engagement ring away to lots of couples. I don’t believe that there are many wolves in the world that had as much interaction with people as Ashak did. Thousands of photos have been taken of him, and he touched so many people in his life. On the rescue scene we were alerted about two different wolves, one in Pretoria at a veterinary practice and one in KZN at a SPCA branch. Unfortunately neither considered HuskyRomi to be suitable alternative accommodation for the animals. I have heard that the one in KZN was pts, but do not know what happened to the one in Pretoria, because we could never manage to speak to anybody but the person answering the phone on that side and were told in no uncertain terms that the wolf had nothing to do with us or us with him. I can but hope that they did find him a home, but have a feeling that he was pts as well. Late one Sunday afternoon earlier in the month, I received a message in my voice mail from a veterinary practice way on the other side of town in Sandton. As you know, we live in Roodepoort. 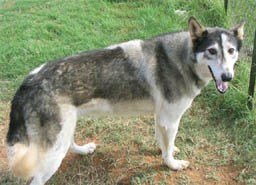 The lady said that they had one of the wolves staying with us, Wahya, with them. He was picked up as a stray and taken in to them. Well, Wahya was lying right next to me, so I found this very strange. Unfortunately the practice was closed when I called back, so it had to wait for the next day. I just made sure in the meantime about all the information that I have on his microchip and requested an online copy of his registration certificate from Identipet as well. It turned out that somebody must have had numbers swapped or something in that line and that was how our detail was given to the practice. 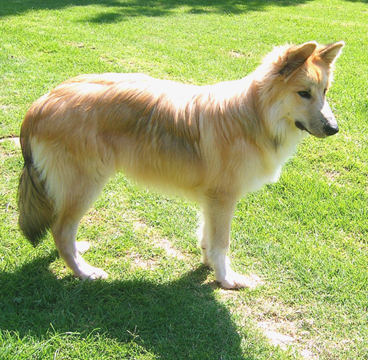 The poor stray animal was micro-chipped, but the chip number was not on the Identipet database, so either the owner never registered him, or the number was issued by a different company and therefore did not show up on the Identipet database. This caused me to look deeper into the microchip chaos in our country (and probably worldwide) with numerous animals running around with microchips that actually cannot be traced. When Yiska came to stay with us, I immediately had him micro-chipped. 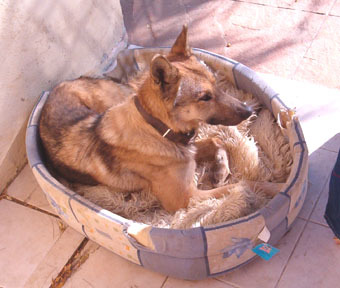 The vet implanted a VirBac Backhome microchip and registered him on the Backhome database. I read an article about a batch of Backhome chips that could not be read, and being the paranoid being that I am, took him to a totally different vet just to have him scanned and the chip number confirmed. I also found out that Identipet has a countrywide database and that they are willing to register all microchips on their database, even if they are not Identipet chips. I immediately did that and paid for a lifelong membership with Identipet. When Wahya received his chip (at the same vet), it was a Five Star ID chip. This time I was given the chip detail and a website and told to register him myself. I did it, and also registered him on the Identipet database, paying for a lifelong membership. I originally thought that the type of microchip could be gathered from the chip number, but this is not so, meaning that an animal picked up with a chip from company A, cannot be traced unless the person doing the enquiry calls up company A. It seems to me that, because Identipet started this “universal” database, the vets tend to call them, and probably only them. They have a 24 hour hotline as well as a cell phone app (that I am struggling to get to work, seems to be more IOS friendly than Android). Apparently there are also a number of companies that supplied microchips in the past that have closed their doors and no longer operates. Nobody knows what happened to their databases. A couple of things came out of this little incident and that is why I am rambling on about it. Firstly, please have your pets micro-chipped. Secondly, make sure that the vet scans the chip and that it corresponds with the number given to you. Then register your pet on the database of the company that supplied the chip (if the vet did not do it, but go and check), but also on the Identipet universal database. I am by no means trying to advertise Identipet, but while they have started delivering this service and with the information that I received, I really want to strongly recommend it. If your animal was chipped previously and you are not sure if the chip still works, or do not have the number, please have him or her scanned and then also register that chip number on the universal database. Then at least you know it will pop up on the primary enquiry should your pet ever be scanned. The information on the database is not shared with anybody. All they give the vet or the rescuer when they query a number, is the name of the registered owner, the name of the animal, and the primary telephone number. Please also make sure that your phone number is up to date on the database. Only you can access your own information in full, and to get the names and phone number as stated, the person enquiring must be a registered vet or rescue organization and supply their registration number at the time of the request. I think that is safe enough for your pet’s security and worthwhile following up. One more little thing I discovered. There are chip scanners available on the market that cannot read chips from other companies. I believe that most vets use either Backhome or Identipet scanners and as I read it, they are certified to read all chips currently available as well as the older chips with shorter numbers. Take care and keep howling. Check out the HuskyRomi Wolf Sanctuary’s Facebook page for more information. If you wish to subscribe to HuskyRomi’s monthly newsletter, mail Frans Badenhorst at wolfrescuesa@gmail.com and have yourself added to the mailing list. It’s FREE! Wyoming is at it again. Barely a year after Wyoming wolves lost Endangered Species Act protection, the state is proposing steep increases in the number of wolves allowed to be killed by hunters. Defenders is going to do what it takes to stop this, but we need your help. 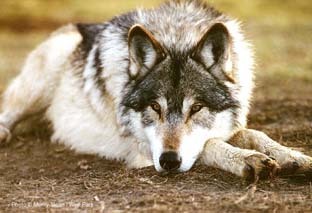 It was just a year ago last month that a federal court stripped Wyoming’s wolves of Endangered Species Act protection. The court upheld a state plan that declares 84% of the state a “predator zone” where wolves can be hunted or trapped by anyone, at any time. And wolves aren’t the only animals whose fate Wyoming is recklessly endangering. We recently wrote to you that the state is considering a proposal to allow up to 23 grizzly bears to be hunted in the greater Yellowstone region. With your help, Defenders is on the ground in Wyoming. We’re pressing state officials to reconsider their actions. With you at our side, we’re rallying conservationists to demand adequate safeguards for wolves and grizzly bears. And thanks to you, we’re keeping the issue of wolf and bear protection front and center as an issue in Wyoming. Wolves and grizzly bears have no voice of their own. That’s why you and I must speak for them. You know this is a treacherous time for wildlife conservation. And it’s especially treacherous for wolves, which continue to be the victims of outdated and ignorant mindsets. The hopeful news is that most Americans believe in wildlife protections. And sooner or later, sanity will prevail. But in the meantime, it’s up to all of us do what we can. 1. Germany: Wolf found shot dead in Pumpak territory – We offer a reward! On 13 April, our colleague Katarzyna, who is doing wolf research on the Polish side of the Lausitz in the vicinity of Ruszow, discovered the body of a wolf on the banks of the river Neiße. Polish and German police have started a manhunt. The wolf was most probably shot at the beginning of April, over Easter. The locality is Dobrzyn (on the Polish side), at about the level of Steinbach, Ungunst, Lodenau (Rothenburg OL) on the German side. But this spot may not necessarily be the actual crime scene. If anybody can provide relevant information, e.g., saw people with rifles along the Neiße or heard one or more shots being fired, please contact the police in Görlitz or Zgorzelec, or Alexander Januszkiewicz through the contact form on our website. Information that will lead to the arrest of the perpetrator(s) will be rewarded by us (Wolfsschutz Deutschland and Dolnoslaskie Towarzystwo Ochrony Wilkow) with Euro 2000. We really hope that our reward will contribute to having one of these criminal poachers arrested eventually. Thank you for signing our petition to save wolves by keeping them protected under the Endangered Species Act. We thought you might like to know about our latest petition: we’re trying to end trophy hunting of wolves, grizzlies and elephants. Below is a link to that petition. Thank for your support, and for standing up for wildlife. Trump’s putting bears, wolves and elephants in the crosshairs of trophy hunters. Yellowstone’s grizzlies had been safe from trophy hunters for the past 40 years. But last summer Trump stripped them of their Endangered Species Act protection. Now state officials in Wyoming are dead set on letting trophy hunters gun down 24 grizzlies that wander out of the national park. More than half of them could be females, including those pregnant with cubs. No wild creature should ever be caught in the crosshairs of an AR-15. It’s all part of a trigger-happy culture that fetishizes the thrill-killing of endangered wildlife. One of Trump’s first acts as president was allowing trophy hunters in Alaska’s national wildlife refuges to slaughter wolves and their pups where they slept, and to bait bears out into the open so they could shoot them from airplanes. Trump has also refused a full-on ban of elephant trophy imports — a step that’s vital to ending the savage killing that’s put elephants on the path toward extinction. The Center for Biological Diversity is fighting the cruel laws that allow this kind of brutality — and we’re challenging the sick mentality glorified by Trump’s administration and anti-wildlife agencies. We simply can’t allow grizzlies, wolves, elephants and other wild animals to be thrill-killed into extinction. Wildlife belongs in the wild, not hanging over a fireplace or on a living-room floor. Join our resistance — sign our petition to stop the slaughter of wildlife being hunted for their heads and skins. Fear of facing their own self, of looking at oneself to see how one can grow as a human being, on how to become a valuable member of society. Soldiers, policemen, fire fighters, etc, know that they put themselves in harm’s way when they choose their careers, that’s why this is considered noble. Not so the trophy-hunters, they kill animals for their own perceived glory, be that an animal carcass, the thrill of the rush of having killed something alive, as well as the recognition from fellow trophy-hunters. They are attention-whores, that’s why they pose with the carcasses, grinning ostentatiously. They kill from a safe distance without putting themselves in harm’s way; they chase cheap thrills, meaningless accumulations of material and emotional content, i.e. trophies. Self-absorbed children in adult bodies. Mother’s Day came early this year at the Wolf Conservation Center! Red wolf F2121 (affectionately nicknamed Charlotte) gave birth to four pups during the afternoon of April 19 and were followed by six pups, born to a different mother (red wolf F1858 or Veronica), just hours later. With high pitch peeps and squeals, the adorable new residents announced their debut to a global community of onlookers via the WCC’s network of live webcams. Beyond being cute, the pocket-sized predators represent the WCC’s active participation in an effort to save a species from extinction. While the WCC has been a vocal and visible advocate in trying to protect and preserve critically endangered red wolves, the center is also active in physically safeguarding representatives of the rare species that have been entrusted to its care. The WCC is one of 43 facilities in the U.S. participating in the Red Wolf Species Survival Plan (SSP) – a breeding and management program whose primary purpose is to support the reestablishment of red wolves in the wild through captive breeding, public education, and research. Red wolves, native to the south-eastern United States, were almost driven to extinction by intensive predator control programs and habitat loss. In 1980, the U.S. Fish and Wildlife Service (USFWS) captured the last wild red wolves (just 14 animals) and declared the species extinct in the wild. 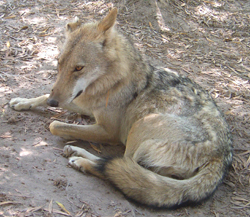 In 1987, USFWS released the first captive red wolves in North Carolina’s Alligator River National Wildlife Refuge as part of a federal reintroduction program under the aegis of the Endangered Species Act. Current estimates put the wild population at the lowest level in decades, down from 130 just four years ago to fewer than 30 today. 2.Wolf Conservation Center ‘Dencam’ Captures Birth of Rare Mexican Gray Wolf Pups! After welcoming two litters of critically endangered red wolf pups less than two weeks ago, the Wolf Conservation Center is celebrating the arrival of critically endangered Mexican gray wolf pups as well: more info here. There are only 114 wild Mexican gray wolves living in the United States, so every new arrival represents a priceless contribution to the recovery the rare and at-risk species. 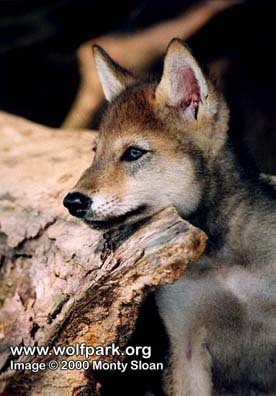 The WCC is one of more than 50 institutions in the U.S. and Mexico participating in the Mexican Wolf Species Survival Plan – a bi-national initiative whose primary purpose is to support the reestablishment of Mexican wolves in the wild through captive breeding, public education, and research. 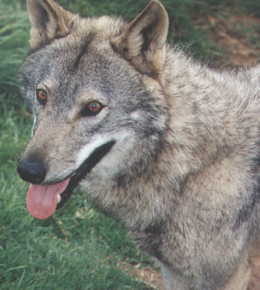 Because the entire existing Mexican wolf population descended from just seven founders rescued from extinction, genetic health is the primary consideration governing not only reproductive pairings but also captive-to-wild release efforts. Although both components are equally critical to Mexican wolf recovery, release events are far less frequent than successful breeding. In recent positive steps toward recovery, the U.S. Fish and Wildlife Service (USFWS) has been ushering genetically diverse captive wolf pups into the wilds of Arizona and New Mexico through its pup cross-fostering initiative. 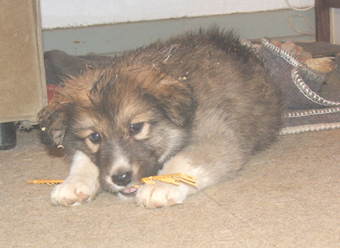 Cross-fostering is a coordinated event where captive-born pups are introduced into a similar-aged wild litter so the pups can grow up as wild wolves. The Mexican wolf newborns, who will not be able to open their eyes for a week or so, are not eligible for wild-foster due to their litter size. The wolf parents and pups are not on public exhibit, but thirteen live webcams, available on the WCC website, invite an unlimited number of viewers to enter the private lives of these elusive creatures. Join them now via live webcam. Today Ambassador Wolf Atka turns 16 years old! The confident and charismatic ambassador has won the hearts and opened the minds of hundreds of thousands of people throughout his storied career. Although Atka retired from his career as a travelling Ambassador a couple of years ago, he continues to interact with advocates around the world. In May 2017, Atka created his own email account (atka@nywolf.org) and has welcomed a steady stream of passionate emails ever since! He’s Skyped with a budding scientist in Mexico, chatted with conservationists in Europe, and has received fan mail from all seven continents – even Antarctica! And now with his own set of wheels, his reach knows no bounds! Happy Sweet 16, Atka! We love you! Thank you, Atka, for allowing the world to form lasting connections with not only you but your wild kin as well! 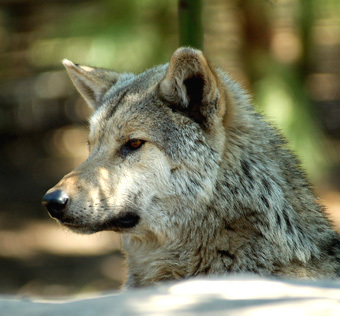 The following is a summary of Mexican Wolf Reintroduction Project (Project) activities in the Mexican Wolf Experimental Population Area (MWEPA) in Arizona, including the Fort Apache Indian Reservation (FAIR), San Carlos Apache Reservation (SCAR), and New Mexico. Additional Project information can be obtained by calling (928) 339-4329 or toll free at (888) 459-9653, or by visiting the Arizona Game and Fish Department website at azgfd.gov/wolf or by visiting the U.S. Fish and Wildlife Service website at fws.gov/southwest/es/mexicanwolf. For information on the FAIR call (928) 338-4385 ext. 226 or visit wmatoutdoors.org. Past updates may be viewed on these websites. Interested parties may sign up to receive this update electronically by visiting azgfd.com and clicking on the E-news Signup tab on the top left corner of the web page. In April 2018, The U.S. District Court of Arizona issued an adverse decision on the revised 10(j) rule litigation, remanding the 2015 10(j) rule to the USFWS. The 2015 10(j) rule will remain in effect for the foreseeable future until the completion of this litigation. On April 5, staff from the USFWS presented at the Arizona tribal/FWS coordination meeting. Management of Mexican wolves on tribal land was discussed. From April 9-12, staff from USFWS, AZGFD and New Mexico Department of Game and Fish attended the annual Trilateral committee meeting for wildlife and ecosystem conservation between the United States, Mexico and Canada. Staff presented to the Committee and attended management sessions that were held on Mexican wolf recovery. Numbering System: Mexican wolves are given an identification number recorded in an official studbook that tracks their history. Capital letters (M = Male, F = Female) preceding the number indicate adult animals 24 months or older. Lower case letters (m = male, f = female) are used to indicate wolves younger than 24 months. A lower case letter “p” preceding the number is used to indicate a wolf pup born in the most recent spring. 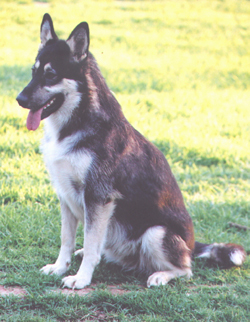 The capital letter “A” preceding the letter and number indicate breeding wolves. The IFT completed the annual year-end population survey which started November 1, 2017 and concluded with helicopter count and capture operations conducted from January 24, 2018 through February 3, 2018. The year-end minimum population count for 2017 was 114 wolves in the wild in Arizona and New Mexico. Annual surveys are conducted in the winter as this is when the population experiences the least amount of natural fluctuation (i.e. in the spring the population increases dramatically with the birth of new pups and declines throughout the summer and fall as mortality is particularly high on young pups). 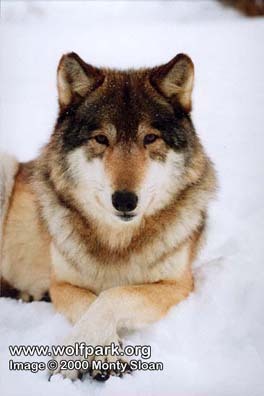 Thus, the IFT summarizes the total number of wolves in the winter at a fairly static or consistent time of year. This allows for comparable year-to-year trends at a time of year that accounts for most mortality and survival of young pups. At the end of April, there were 75 wolves with functioning radio collars that the IFT was actively monitoring. In April, the Bear Wallow Pack was located within their traditional territory on the east central portion of the Apache-Sitgreaves National Forest (ASNF), and occasionally documented on the SCAR. Yearling female 1683 continued to make dispersal movements north and east of Bear Wallow’s traditional territory, but frequently rejoined the pack. Alpha female 1335 exhibited behavior and movements consistent with denning. In April, the IFT documented Bluestem in the pack’s traditional territory in the central portion of the ASNF. Yearling female 1686 has been exhibiting localized behavior and movements suggesting that AF1042, which has a non-functioning collar, may have denned. In April, the Elk Horn Pack was located within their traditional territory in the northeastern portion of the ASNF. This month, two neonatal pups born in captivity at the Endangered Wolf Center were cross-fostered by the IFT into the Elk Horn den. The IFT initiated a supplemental food cache near the den as part of the cross-foster effort and to reduce the potential for livestock-related conflict. The Elk Horn Pack continued to display behavior consistent with denning after the cross-foster operation was conducted. 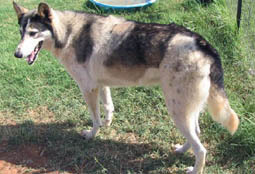 In April, the Frieborn Pack was documented within their territory in the east central portion of the ASNF in Arizona and New Mexico. This month, two neonatal pups born in captivity at the Endangered Wolf Center were cross-fostered by the IFT into the Frieborn den. The IFT initiated a supplemental food cache near the den as part of the cross-foster effort and to reduce the potential for livestock-related conflict. 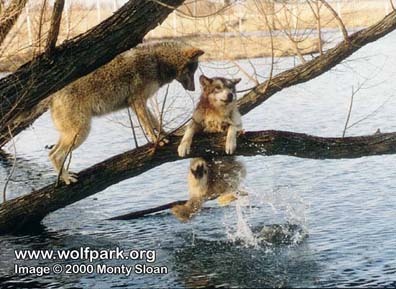 The Frieborn Pack exhibited behavior and movements consistent with denning after the cross-foster operation was conducted. In April, the Hoodoo Pack was located within their traditional territory in the northeastern portion of the ASNF. The IFT hazed the Hoodoo Pack several times this month in the Nutrioso area to deter them from frequenting areas with residences. At the end of the month, the IFT initiated a diversionary food cache to reduce potential for conflict. The Hoodoo Pack displayed behavior consistent with denning within their traditional territory during April. In April, the Maverick Pack was located within their traditional territory both on the FAIR and east central portion of the ASNF. In April, the Panther Creek Pack was located in their traditional territory in the east central portion of the ASNF. Alpha Female 1339 and AM1382 have joined up and have been documented travelling as a pair. Sub-adult M1574 has been travelling separately from the pack. In April, the Pine Spring Pack was located within their territory in the north central portion of the ASNF. The IFT continued to maintain a diversionary food cache on the ASNF for this pair to reduce potential for wolf-livestock conflict. The Pine Spring Pack displayed behavior consistent with denning within their territory during April. In April, the Prime Canyon Pack was documented travelling within a territory in the east central portion of the ASNF. Alpha female 1488 has been exhibiting behavior and movements consistent with denning behavior. In April, the Saffel Pack was located in their traditional territory in the northeastern portion of the ASNF. The Saffel Pack displayed behavior consistent with denning within their traditional territory during April. In April, F1550 of the Hoodoo Pack had localized in the east central portion of the ASNF and has been consistently documented travelling with M1571 formerly of the Diamond Pack. This pair has been documented travelling together and maintaining a territory for over three months and have been named the Sierra Blanca Pack. In April, M1477 was documented in the east central portion of the ASNF. In April, the Baldy Pack was documented travelling in the eastern portion of the FAIR and the north central portion of the ASNF. In April, the Tsay-O-Ah Pack was located within their traditional territory on the FAIR. In April, M1559 and F1679 were assigned a pack name (Tu dil hil) after three months of travelling together. They were documented travelling in the eastern portion of the FAIR. 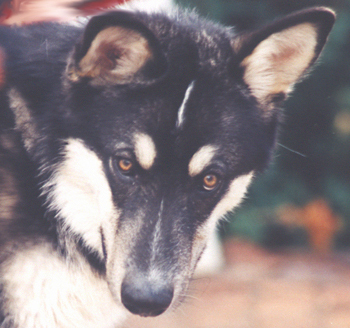 During April, the Copper Creek Pack was not located. Currently there are no functioning collars in this pack. Single M1673 was documented travelling within the Copper Creek territory in April. The IFT is monitoring this to determine if it has joined the pack. During April, the Dark Canyon Pack was documented travelling together within their traditional territory, in the west central portion of the GNF. During April, F1685 has continued to travell with M1453 in the western portion of the CNF for a period of three months, and the pair is now considered the Datil Mountain Pack. During April, AM1038, formerly of the Hawks Nest Pack, has continued to travell with F1473 in north central portions of the GNF for a period of three months. The pair is now considered the Hawks Nest Pack. The IFT documented behavior consistent with denning in mid-April. During April, the Iron Creek Pack continued to utilize their territory in the northern portion of the Gila Wilderness and the southern portion of the GNF. During April, the Lava Pack was located within their traditional territory in the southeastern portion of the GNF. During April, the IFT documented the Leopold Pack within their territory in the northern portion of the Gila Wilderness. During April, the Luna Pack remained in their traditional territory in the north central portion of the GNF. The IFT maintained a food cache for the Luna Pack to reduce potential for livestock conflict. 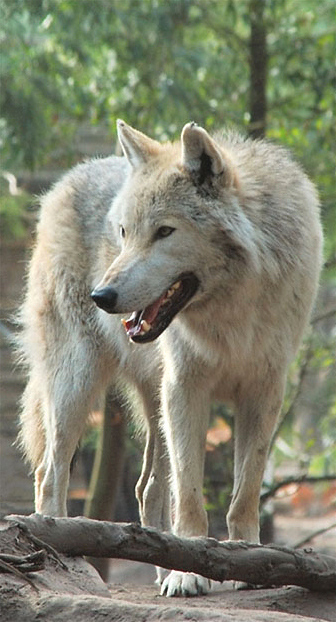 In late-April, the Luna pack displayed behavior consistent with denning. During April, the Mangas Pack was located within their territory in the northwestern portion of the GNF. The Mangas Pack displayed behavior consistent with denning within their traditional territory. The IFT maintained a diversionary food cache for the Mangas Pack to reduce potential for livestock conflict. During April, the Prieto Pack was located within their traditional territory in the north central portion of the GNF. The Prieto Pack displayed behavior consistent with denning within their traditional territory. During April, the San Mateo Pack continued to utilize their territory in the north central portion of the GNF. The IFT documented behavior consistent with denning for the San Mateo Pack in late April. During April, the SBP Pack continued to use their traditional territory in the north central portion of the GNF. AM1284, mp1667 and fp1682 were not located in April. In late-April, the SBP Pack displayed behavior consistent with denning. During April, AM1155 of the old Morgart’s Pack was not located by the IFT. During April, M1486 travelled throughout the northern and central portions of the CNF. During April, M1561 dispersed into Arizona and continued to make wide dispersal movements on both the ASNF and Coconino National Forests. During April, M1673 travelled throughout the southern portion of the GNF. There were no mortalities documented in April. 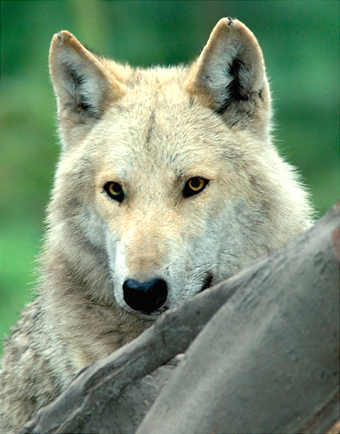 During the month of April, there were 12 confirmed wolf depredation incidents on livestock. There were 5 nuisance incidents investigated in April. From January 1 to April 30, 2018 there have been a total of 29 confirmed wolf depredation incidents in New Mexico and 11 confirmed wolf depredation incidents in Arizona. On April 2, Wildlife Services investigated a dead cow in Catron County, NM. The investigation determined the cow was a confirmed wolf kill. On April 2, Wildlife Services investigated a dead calf in Catron County, NM. The investigation determined the calf was stillborn. On April 4, Wildlife Services investigated a dead cow in Catron County, NM. The investigation determined the cow died of natural causes. On April 4, Wildlife Services investigated a dead calf in Catron County, NM. The investigation determined the calf was a coyote kill. On April 5, the IFT took a report of wolves located near an occupied dwelling and livestock in Catron County, NM. The IFT and Wildlife Services investigated the incident. The IFT provided less than lethal training and rounds to the reporting party. On April 6, Wildlife Services investigated a dead cow in Catron County, NM. The investigation determined the cow was a confirmed wolf kill. On April 7, Wildlife Services investigated a dead cow in Catron County, NM. The investigation determined the cow was a confirmed wolf kill. On April 9 and 10, the IFT received reports of two elk killed by wolves in the Nutrioso, AZ area. Both of the elk carcasses were removed by the IFT to eliminate any further attractant to wolves returning to areas with a concentration of residences. The IFT resumed efforts to haze wolves that entered the Nutrioso area and focused hazing efforts during nighttime hours. The IFT provided less than lethal training and rounds to five residents in Nutrioso to use to haze wolves if wolves were observed near residences on private property. On April 11, Wildlife Services investigated a dead cow in Catron County, NM. The investigation determined the cow was a confirmed wolf kill. On April 13, Wildlife Services investigated a dead bull in Apache County, AZ. The investigation determined the bull was a confirmed wolf kill. On April 17, Wildlife Services investigated a dead cow in Catron County, NM. The investigation determined the cow was a confirmed wolf kill. On April 18, Wildlife Services investigated a dead bull in Apache County, AZ. The investigation determined the bull was a confirmed wolf kill. On April 19, Wildlife Services investigated a dead cow in Catron County, NM. The investigation determined the cow was a confirmed wolf kill. On April 19, Wildlife Service investigated a dead calf in Socorro County, NM. The investigation determined the calf was killed by a coyote. On April 21, Wildlife Services investigated a dead calf in Greenlee County, AZ. The investigation determined the calf was a confirmed wolf kill. On April 21, Wildlife Services investigated a dead cow in Greenlee County, AZ. The investigation determined the cow was a confirmed wolf kill. On April 23, Wildlife Services investigated a dead calf in Catron County, NM. The investigation determined the calf was a coyote kill. On April 24, the IFT received a report of an elk killed by wolves in Auger Canyon near a residence and that three wolves were observed feeding on the carcass. The IFT determined from GPS points that the Hoodoo Pack had location points on the elk kill. On April 27, the IFT received a report of an elk having been killed by wolves approximately 250 yards from the nearest residence in Nutrioso. The elk was removed from the location. A diversionary food cache was started near the Hoodoo Pack den to mitigate wolves hunting and killing elk in proximity to houses. Members of the Hoodoo Pack have been using the diversionary food cache regularly. The IFT maintained a presence in the Nutrioso area in effort to haze wolves if they returned to the valley and to visit with residents to provide self-help information on what to do if a wolf was encountered. The IFT has taken management action in this situation due to the wolves’ repeated use of areas in close proximity to homes. It is important to note that the wolves have not been remaining in the community during the day and on the few occasions when encountered by people, the wolves have run away. On April 27, Wildlife Services investigated a dead calf in Greenlee County, AZ. The investigation determined the calf was a confirmed wolf kill. On April 27, Wildlife Services investigated an injured calf in Greenlee County, AZ. The investigation determined the calf was injured by a bear. On April 30, Wildlife Services investigated a dead cow in Catron County, NM. The investigation determined that the cow was a confirmed wolf kill. On April 10, WMAT presented on KNNB radio in Whiteriver, AZ. On April 14, USFWS personnel presented to a group at the Phoenix Zoo. On April 25, USFWS and AZGFD presented at a meeting held in Springerville hosted by Apache County. The USFWS welcomed two new volunteers in March and two in April to the program. During this time, three other volunteers completed their volunteer commitment with the USFWS, moving on to other career opportunities and experiences. Thanks for all your hard work and dedication! Losing the pillar & a mother everyone leaned on, has meant huge adjustments for everyone involved with SanWild. We are doing what we can to pull together and continue the dream and vision she had. The animals she saved depend on us to ensure they are fed and cared for. The immediate need is as always the lions and to continue to be able to put out Teff & Lucerne. With 11 lions to feed it is a costly part of the ongoing financial need. If there are any companies or individuals who would like to sponsor either a lion or a pride on an ongoing basis please do let us know. We are registered as a public benefit organization, which means that donations from within South Africa are fully tax deductible. Branch: Danie Joubert Street, Tzaneen,0850. Personally, I would like to thank each and everyone that has contacted me about the passing of my mom. It is amazing to see how many people she touched through the amazing work she has done. I won’t lie, it is very difficult for me to accept that my mom, is not just a phone call away anymore…and the pain of losing her is still very raw and the emptiness unbearable, but she would have wanted us to be strong and protect what she has build and fought for, for so many years, and that is each and every animal that has found their forever home at SanWild. My mom had so much knowledge and was so driven, a one in a million type of women that I am very proud of. I might not have all the knowledge that she had but I shared her passion and so did all the other trustees and so many supporters and friends of her and SanWild and through that, WE WILL do everything to keep SanWild up and running. Please bare with me if I do not get to everyone’s messages right away but please know I will answer everyone soonest. Thank you for all your support, this really means allot to us. Yes, you are not dreaming – Johnny is back with his ZCTF reports from Zimbabwe. Johnny, welcome back – with really missed you! The previous First Lady, Grace Mugabe, is under investigation for smuggling and exportation of ivory, gold and diamonds out of Zimbabwe. Investigators only touched the tip of the iceberg as it is believed that Ms. Mugabe started smuggling as early as 2005 while serving in her role as First Lady. Ms. Mugabe had a history of being very friendly with one of the female Chinese Nationals and it is of our opinion that they were likely working together. After the investigation takes place, if Ms. Mugabe and other senior members of government are found guilty or involved in the smuggling of ivory, they should be prosecuted and brought to justice. Monies derived from the sale of ivory and wildlife should be confiscated and repaid to the National Parks. The Professional Hunters (PH) fraternity of Zimbabwe lost all ethics of hunting when they killed collared wildlife. Ethical considerations fell to the wayside during the previous regime due to corruption and greed. The death of the big tusked elephant in Gonarezhou can be added to the increasing list of collared animals killed by trophy hunters to include Cecil and Xanda among others. There are too many conflicting reports offered up by researchers, safari operators, hunters and people responsible for collaring the wildlife. A Memorandum of Understanding between hunters, safari operators and researchers should state that any collared animal should not be shot, killed or disturbed in any manner. People involved in hunting a collared animal should be penalized appropriately to deter others from committing similar actions. The Professional Hunter involved with the recent killing of the collared big tusked elephant is part owner of the Three Monkeys Restaurant in Victoria Falls. We believe this restaurant is a lucrative business that serves a wide variety of exotic meat and steaks. The procurement and source of the meat served leaves the ZCTF highly suspicious, as no matter what you order in the way of steaks and or meat, they seem to have it. People should be aware that in many instances they are eating wildlife. ZCTF just learned that four lions and ten hyenas have been captured for export to China. These numbers are in addition to the eighteen hyenas and ten lions exported earlier to China. China placed a new order for an additional 200 baby elephants. The new order for 200 baby elephants is in addition to the outstanding order of 100 baby elephants that remain to be captured. This is NOT conservation. Earlier in February, four crocodiles were captured in Hwange to be exported to China. This capture occurred under the new President. It appears nothing much has changed at this point. Perhaps positive changes for conservation will happen with the election of a new democratic government. In addition to the loss of wildlife due to poaching and hunting; habitat loss is at an all-time high through deforestation. Trees, indigenous to Zimbabwe, are being felled. These trees and timber are being exported out of Zimbabwe to China. This has to stop. CITES gave their constitution, governing rules and regulations to the world. Too many regulations are being broken and ignored in Africa. Nothing is being done. Where is CITES as the habitats and wildlife are being pillaged in Africa? How do Wolves react to venomous snakes? Why are dogs not scared of snakes? Most people shun contact with snakes, even if they have never made bad experiences with reptiles. This instinctive aversion is probably an evolutionary artefact of our past and meant to protect us from dangerous strikes. With dogs, it is a different story entirely: Much to the distress of their owners, they will often approach a snake without any partiality. In Europe, the common adder may pose a risk to them occasionally, but in the US, thousands of strikes, mainly by rattlesnakes, are recorded every year. Curiosity is the driving force behind how these encounters play out, that is what a team of researchers headed by Michele Mulholland from the California State University in San Marcos thinks. Their experiments even demonstrated that the scent of a venomous snake was more attractive to dogs than that of a harmless one. Their publication in the journal Applied Animal Behaviour Science describes how a total of 117 domestic dogs responded to four different scent samples and inspected them. These samples had been created by placing a mouse, a slug, a non-venomous snake represented by a boa constrictor, and a venomous rattlesnake on sheets of newspaper until their scents had been transferred to them. While the mouse scent was clearly the most attractive one to the dogs, it also showed that the scent of the venomous reptile was more attractive than that of the harmless one. The scent of the slug attracted the least interest. To find out whether the dogs experienced fear when they sniffed the samples, it was recorded by which nostril they inspected the individual scents. The background for this is results from previous studies that indicated that dogs will analyse scents suggesting danger primarily with the right nostril and thus with the right side of the brain. 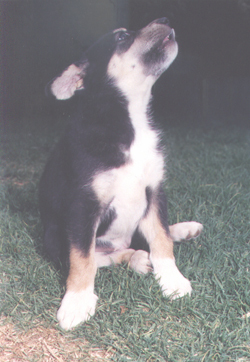 In the current experiments, however, the dogs took in all scents with both nostrils, suggesting they did not experience fear. These results are enigmatic from a perspective of evolutionary biology. Why do dogs lack an inheritent fear of snakes even though strikes from venomous ones have been harming them on a regular basis? Dogs, and their wild ancestors, have had contact with snakes forever, which means they had enough time to develop and genetically embed an appropriate protection mechanism. Has this mechanism perhaps been subsequently lost during the thousands of years of domestication? Answers could possibly be found in a follow-up experiment using wolves. Should these not be afraid of snakes either, then it might be presumed that these reptiles do not pose too much of a threat to them after all. 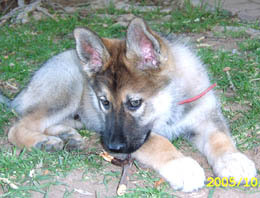 A wild wolf may also be much more careful in an encounter with a snake than a wired dog intent on playing. Alternatively, the answer might lie with the snakes: Being ambush hunters, they depend on not giving away their presence by their scent, neither to their prey nor to their predators. They might therefore mask constituents in their scents that may be detected as warning signals by other animals. This type of chemical camouflage has already been demonstrated to exist in the case of the African puffadder. The question that for now remains to be answered is: How do wolves respond to venomous snakes? 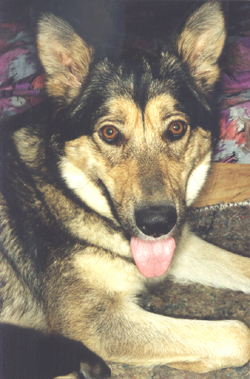 I would like to share the true story as a salute to my “mother wolf Lassie”. I was born in Germany and had a nanny in my first early years. Her husband was a captain on a big ship. Around 1950, he brought a wolf baby back from one of his journeys. This wolf was raised with a lot of problems and a lot of love. 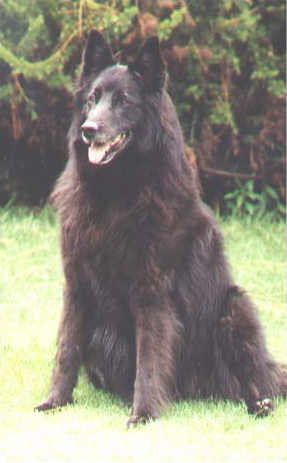 In 1958, I was living in their house and the wolf called Lassie was a good friend of mine. I was 2 years old and one day I crawled into the house of the wolf in the garden, enjoying her scent and beautiful eyes, and I eventually fell asleep lying behind her. My poor nanny was looking for me for a long time. She wondered why Lassie did not come out of her house until she discovered that I was lying behind her. She couldn’t touch me and all she could do was wait. When I woke up I crawled outside and Lassie followed me. The heart of my Nanny stood almost still when she saw us both. An unusual friendship began. I walked with her, slept with her, and I loved her very much. I will never forget her beautiful eyes and the last time I saw her before she died, her golden green eyes full of wisdom and love. Winter has arrived – the days are still pleasantly warm, but the nights speak another language. It’s a bit early for my taste, but who cares about my opinion? With the days getting shorter and shorter the pack is also preparing for wintertime, coming into the house much earlier now in the evenings, cuddling up on the couches, sleeping longer in the mornings, and demanding bigger rations of food. Today the weather is very strange; we woke up to hardly any daylight, only 11 ºC and pouring rain. The furry kids just lifted their heads, peeked out of the window and decided it was the right weather for stay in bed. They have my full sympathy and I wish I could also just sleep the day away, but unfortunately human day schedule does not care about the weather. Ted and I had to get up, wrap up in warm clothes and start to go about our business with an envious look at the kids curling up on the bed, closing their eyes, and not giving a damn. I don’t mind the late rain, for it actually saves me the extra work of watering the garden, but I hate this dimmed grey light with not a hint of sunshine and the cold temperatures. I’m not made for winter, hehe.